A man who can't remember anything meets a man who lost everything, trapped together in the relative safety of the woods while a creature lurks ready to bring death to anything that comes its way. But not all are content to live in a prison, no matter how green. It's a story of survival and courage, created in the pages of mini-comics and brought together in an absolutely gorgeous hardcover by Alec Longstreth. 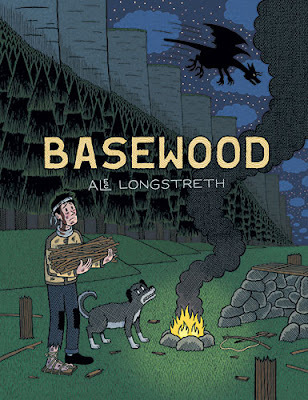 The story of Basewood is the stuff of a fairy tale, complete with a young man refusing to go along with the conventional wisdom, a dragon to defeat, and an old man who councils caution and guards against choices he failed to make. Yet despite this, Longstreth's plot never feels cribbed from anything else. It's familiar but not contrived. He does a great job balancing the arc of the main character against the mentor figure, and we really aren't sure until the very end just how things are going to resolve. The amnesia portion of the story goes just long enough, and when a third figure enters the narrative, I really like how Longstreth handles the dynamic. You know that this is going to change things, but how that change occurs is done in such a way that I think it comes as a bit of a surprise. Longstreth clearly understands the concept of the hero's journey, and uses those parts to really entertain the reader. Visually this book is striking. Longstreth's linework is extraordinarily dense. He uses a combination of heavy blacks, straight lines, cross-hatching and dots to really give a sense of darkness to almost all of the book's pages. 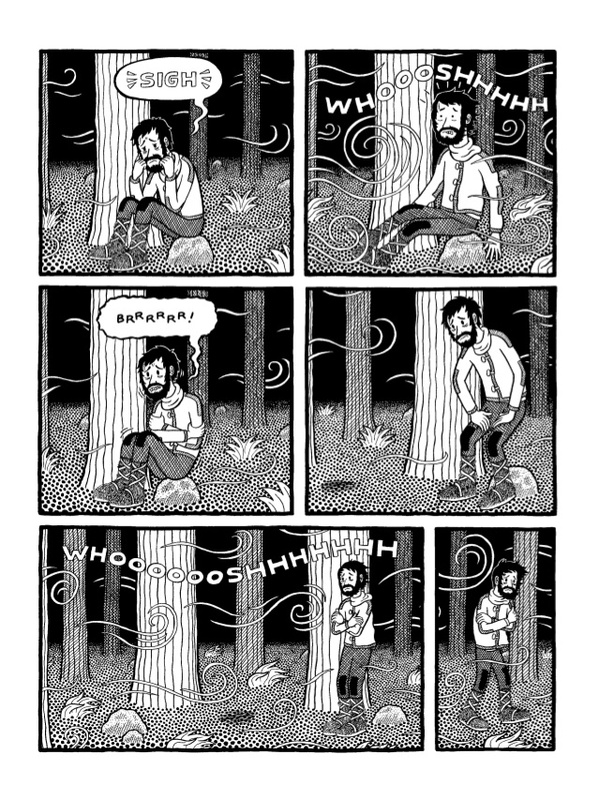 Often, several of these techniques will be featured in the same panel, meaning that we can get a very good idea that the man's clothing contrasts against the dog's fur or the walls of the hut. When we move out into the barren desert, the monster-cliffs, or even flashback sequences in a happier time, the openness of the blank spaces helps set the contrast into a sharp relief. Similarly, when it's snowing, Longstreth's use of white dots all over each panel means we don't need to imagine the snow and how it changes things in the forest--we can see it for ourselves. Though his figure work is a bit on the stiff side--characters move, but they don't flow--I do like how Longstreth makes sure that the facial features change based on the situation and dialogue. He uses Annie-style eyes, so a lot comes from the depictions of slight eyebrows or the curve of a lip. Similarly, the hands of the old man are altered just enough to show they are knurled compared to his younger companions. There's not a huge amount of range--at the basic level of detail his figures are given, Longstreth can only do so much--but what we get works in harmony with the words, not against them. Basewood is a lovely fantasy story with deep roots (and tall trees) in traditional folklore, and was a real joy to read and linger over the pages. It shows that there's a real opening for doing fantasy work in the mini-comics genre, and that it can be done without elaborate, ornate art work or skills at the P. Craig Russell level. I'd love to see more works like these when I'm scouring for new creators to follow at shows. I'm looking forward to seeing what Longstreth does next.